This special 10th-anniversary edition reexamines our place in the natural world in light of sweeping environmental changes and recent advances in scientific knowledge. Since The Sacred Balance was first published in 1997 global warming has become a major issue, with alarming effects being observed on all continents and in the world's oceans. Scientists have also made significant discoveries in various realms, including the state of world ecosystems, the science behind the mother/baby interaction, and the workings of the brain. In this new and extensively revised and amplified edition of his bestselling book, David Suzuki reflects on these changes and examines what they mean for our place in the world. His basic message remains the same: we are creatures of the Earth, utterly dependent on its elements, which are not just external factors, but incorporated into our very essence. Also available in an illustrated edition. 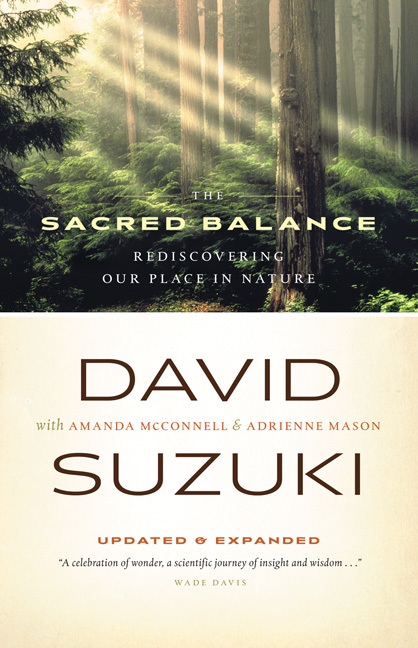 All royalties from The Sacred Balance go to the David Suzuki Foundation.